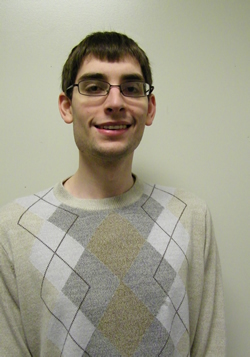 While still in high school, Jeremy approached The Arc NW Indiana to look for a part-time job. A job developer at The Arc uncovered Jeremy's passion to be a magician and entertain kids. He helped Jeremy find a part-time job with FunFlatables, a small entertainment business that caters children's parties and features an inflatable playground. Jeremy continued to work part-time at FunFlatables while completing high school and attending college. His responsibilities included entertaining kids with his magic and monitoring visitors' safety on the inflatables. After graduating from high school, Jeremy approached The Arc again to find a full-time job that paid at least minimum wage and could support him to pursue personal and professional goals. In the short term, he wanted to improve his communication and other workplace soft skills , first by working on them with a job developer and then in a job setting. As longer-term goals, Jeremy wanted to stop receipt of his Supplemental Security Income (SSI) benefits, buy a car, rent an apartment, and save money while working toward a college degree in office administration. He also still had his passion for magic and entertainment, and wanted to explore the idea of developing this passion into a business. Jeremy began by working with a new job developer on communication skills, such as maintaining eye contact, speaking clearly, and staying focused on a conversation. Next, he applied and was hired for a dishwashing position at the local Cracker Barrel restaurant. He practiced his conversational skills at work, getting to know his coworkers. Gradually, Jeremy gained additional responsibilities. Jeremy worked the same schedule, five days a week. He used other blocks of time to develop different aspects of his magician business and personal life. Outside of his work hours, Jeremy ordered business cards and conducted Internet research on advertising his business and advancing his skills as a magician. Having a regular income helped him achieve many of his goals for personal independence, and develop the concept of a future magician business. Over the past year, Jeremy has kept up his work schedule at the Cracker Barrel. He now washes dishes, buses tables, and does other tasks as needed, including opening and closing the restaurant. Jeremy earned recognition as Employee of the Month, which meant a great deal to him. This recognition has boosted his confidence in many social interactions, whether they are with people at the restaurant or audiences he entertains at parties or at the zoo as a magician. Jeremy's income from the job at the Cracker Barrel has enabled him to discontinue his SSI benefits. He is saving his earnings to purchase a new car. His earnings have also enabled him to expand where he performs magic shows by purchasing licenses to perform on the street, at the zoo in Chicago, and at the Taste of Chicago food festival. Jeremy started building his path early, obtaining the job at FunFlatables while still in high school. Jeremy thought carefully about his goals and the things he needed to do personally and professionally to achieve them. Jeremy values his job at the Cracker Barrel and all the support he gained from it to grow personally and follow his passion. Jeremy has used the benefits attained through his jobs (soft skills, a steady income) to further his dreams of being a magician.